Stamford Notes: Bed Bugs in Stamford?!?! I work in the city, where everybody from CBS to The Daily Show is eager to tell me that bed bugs are bustin out of floors, walls and the clear blue sky. It makes me glad that I live in Stamford. BUT WAIT! A little online catastrophizing tells me I should bring my bug-related anxiety home with me. 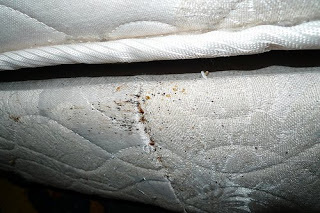 The Stamford Health Department says "The number of bed bugs submissions continues to climb, well over the number of complaints from last year." No telling what that means exactly, but just about this time last year there were 41 reported cases of bed bugs in Stamford, says Bedbugger.com. The Advocate's been on the job too, reporting about a senior center that was de-bugging in November 2009 (even after they thought they'd gotten rid of them in 2007!). The City of Stamford Health Department has a little publication that's pretty basic (and gross) on spotting the leggy creeps, but also includes some stats on how many reports have been made in recent years and a map of where they've come from. A website called The Bed Bug Registry has quite a few Stamford entries. Bed bugs have made their way up to Bridgeport as well, getting their feelers into firefighters. So what do you do about it? The Connecticut Agricultural Experiment Station has a page devoted to the little jerks with some useful resources, and the bottom of that page says "Coming Soon...Bed Bug Handbook and Connecticut Health Department Training Video." Until they get around to that, there are some useful resources from the reluctant experts, NYC.gov. Glad you're highlighting the CT Ag Experimental Station. My sis-in-law is on the board and it has quite an illustrious past and present. Hopefully, those bugs won't make it up to the Merrit Pkwy anytime soon!